Nestled along the timeless Teign Estuary is historic Shaldon, an idyllic little fishing village with its quaint thatched cottages, period houses and narrow winding streets. 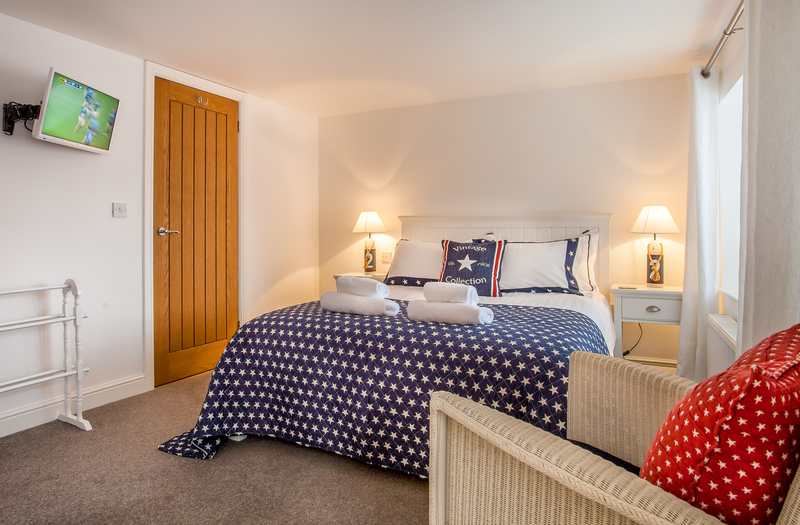 Guests will easily succumb to the stylish coastal charms of this luxury retreat, situated in the heart of the village, less than 1 minutes stroll to the beach. provides three floors of New England style accommodation, all beautifully conceptualised by its Interior Designer owner. 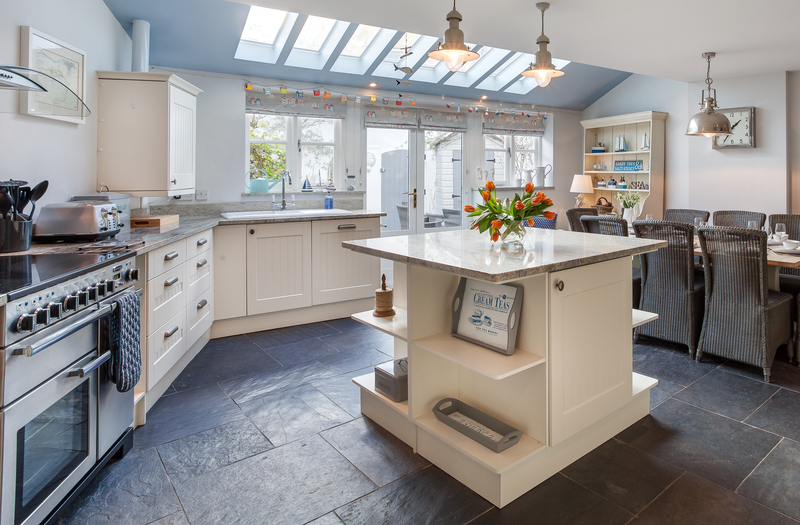 With its nautical tone and family appeal, this beautiful, recently renovated period home, provides a restful and inviting ambience in all seasons. The practical layout is ideal for entertaining and relaxing, with the entrance hall and receptions rooms all situated on the bright and welcoming ground floor, which has slate floors and under-floor heating throughout and with direct access to the sunny private courtyard garden. With its cool palette of classic blues and creams alongside high quality wood furniture and large comfortable sofas, the spacious Sitting Room invites guests to kick off their shoes and simply relax. 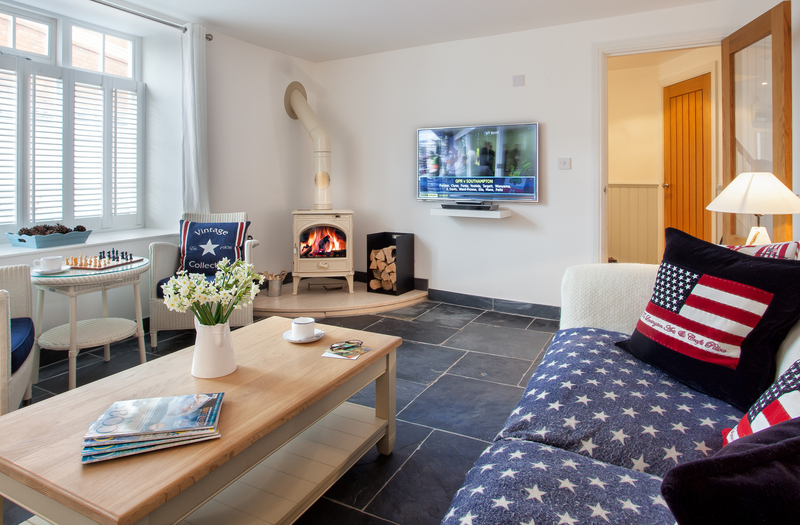 The Sitting Room is generously equipped and includes a 48’’ Panasonic 3D TV with Free Sat channels and Blue Ray DVD player along with a wood burning stove. The large sunny kitchen with French doors opening out onto the private courtyard, is a naturally bright and uplifting setting for relaxed dining and summertime feasts. The kitchen, has a large dining table and chairs, along with up to the minute appliances which include a range cooker with induction hob, microwave, toaster, electric kettle, De Longhi Dolce-Gusto coffee machine, dishwasher and an American style fridge freezer with ice dispenser.There is also a TV and DVD player, ipod/ipad docking station and DAB radio. The Utility Room is equipped with a washing machine, iron and ironing board. Situated off the hallway is a cloakroom WC. From the comforts of the ground floor, a staircase leads to the first floor, where the coastal style decoration continues throughout. There are three bedrooms and a family bathroom. Bedroom 1 has a King size bed, Bedroom 2 has a double bed, and bedroom 3 has a twin trundle bed. Superior mattresses, bed linen and pillows ensure that guests can enjoy a perfect night’s rest. The coastal allure flows through to the family bathroom, which has a traditional style bathtub and a separate shower. There is a shaving socket in this bathroom. At the far end of the first floor hallway, a staircase leads to the master bedroom suite. Decorated in soft whites and blues, this beautiful master suite provides a welcome refuge at any time of day. The vaulted ceiling along with the king size nickel bedstead adds a touch of romance. The en suite bathroom with classic bathtub completes the comfort of this suite. 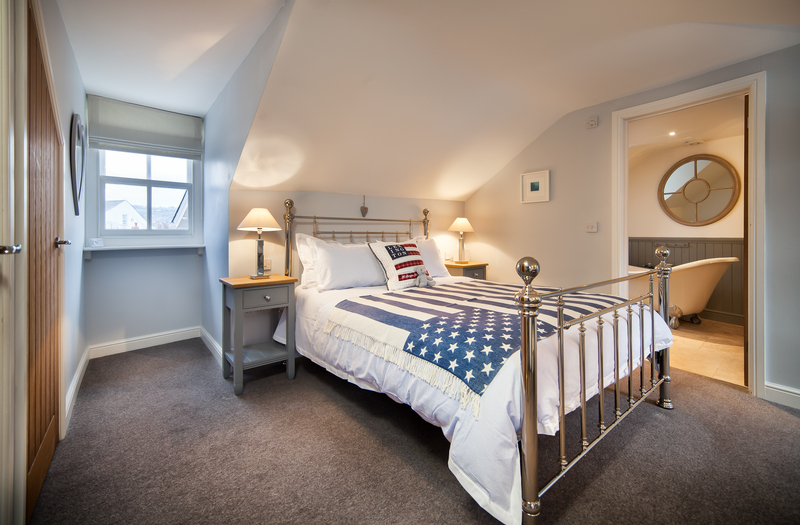 All bedrooms have wall mounted TV/DVD players and are equipped with hairdryers. The lovely holiday home, benefits from under floor heating throughout the ground floor and central heating on the first and second floors. There is one covered private parking space provided, which is located adjacent to the property. 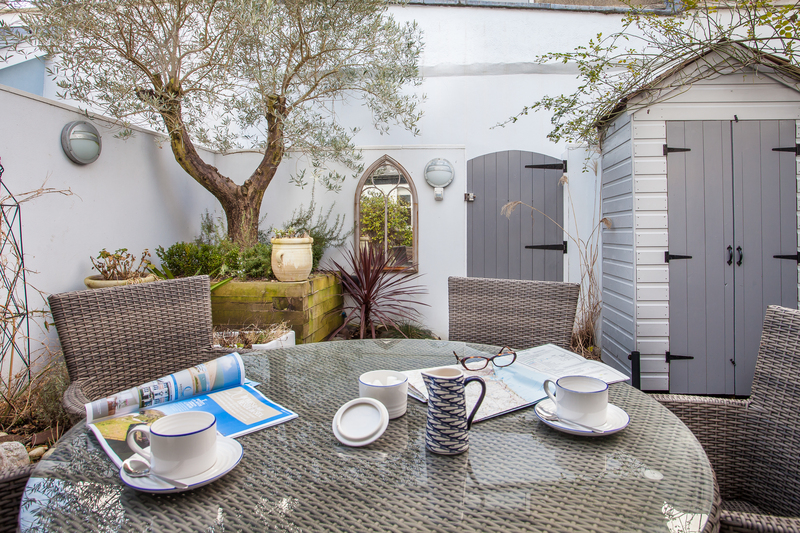 From its desirable location in the heart of Shaldon village, guests are situated just moments away from the beach and all amenities. Shaldon has a butcher, a baker (no candlestick maker) and shops selling local produce as well as friendly pubs and charming cafes. The village offers holiday appeal in all seasons and provides coastal view gourmet and bistro restaurants enabling guests to wine and dine out as many times as they wish during their stay, explaining why Shaldon is fast becoming a top foodie destination and putting the Teign Valley on the Gastro map. The Shaldon ‘to do list’ include a visit to the family-friendly Shaldon Zoo, Shaldon Cliffs Pitch & Putt. It is an easily accessible location for enjoying coastal walks, classic beach days, scenic picnics or a thrilling day out on the water with a boat/kayak rental, water sports and sailing. The passenger ferry takes visitors across the estuary to Teignmouth. Guests can explore more of the South Devon coast, by hopping on the Teignmouth Circular (operated by the Dartmouth Steam Railway and River Boat Company). A host of other attractions also await guests enjoyment, including botanical gardens, the lively appeal of Torquay and a treasure trove of National Trust sites. 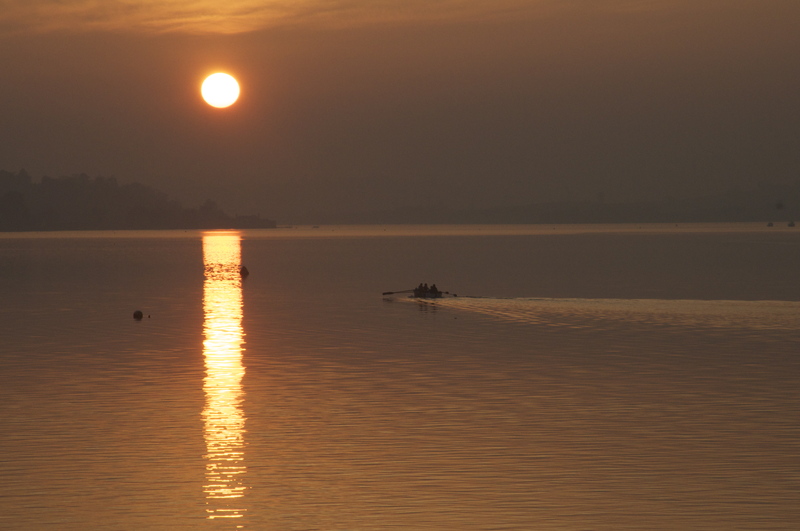 Shaldon is very well connected, with road links, close proximity to Exeter Airport and easy access to the mainline train stations in Teignmouth and Newton Abbot. 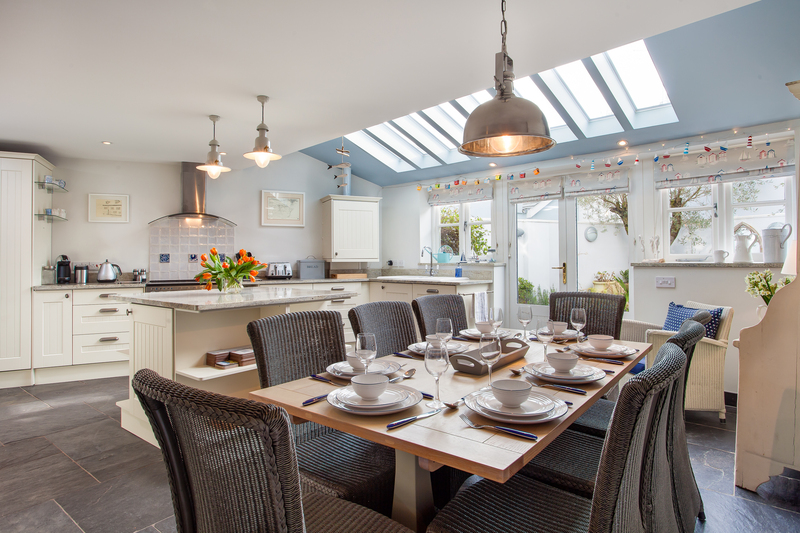 Exclusively marketed by Discovery Holiday Homes based in Torquay, just over the hills from Shaldon.